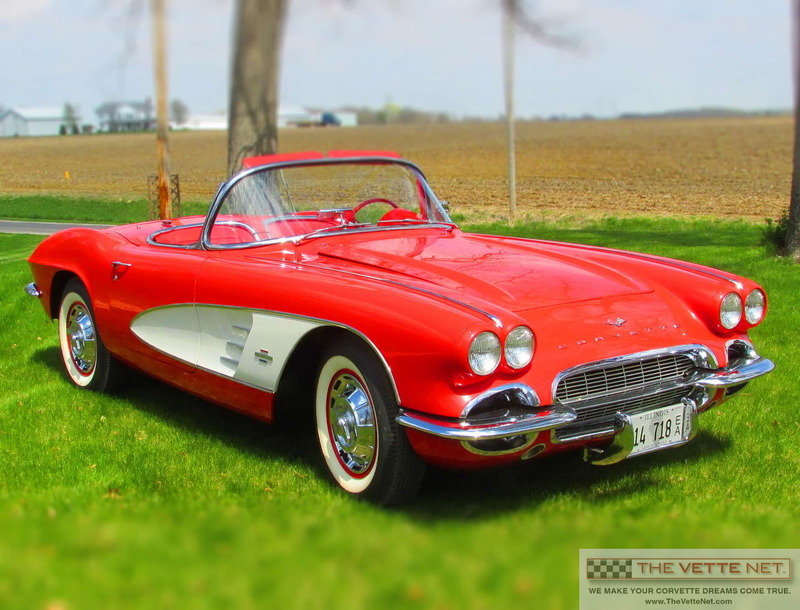 Not too often we have the pleasure to represent a car of this caliber... Our offering today is a Red 1961 Convertible which sustained a thorough off-frame restoration with virtually everything being addressed, either rebuilt or replaced back to factory specifications. Present seller had the car for 19 years and in the last years he embarked on a painstaking process of bringing it to its original glory. Body was taken off the frame. During this process, frame has been sandblasted and refinished including the factory stencils as seen in the pictures. Body received a acrylic lacquer high quality paint in the quintessential combo, Roman Red with White Coves. It appears that may have been the original color combo revealed after peeling successive coats of paint. Brakes were completely rebuilt, also new correct brake lines and master cylinder were installed. Steering was also completely rebuilt. Engine is the factory correct, matching numbers, 283 dual carb rated at 270HP which was rebuilt with all components being freshened up or replaced with new quality parts. Engine was bored oversize, rods resized, all new, heads screw in studs, replaceable valve guides, hardened valve seals for unleaded gas. Block cast is 935, cast date 6/15/61, heads are 962, dated 6/14/61... It is mated with the correct 4-speed manual transmission which was rebuilt with new seals, synchronizers, bearing, etc. It breathes out via a new aluminized exhaust with new hangers and clamps too. Rear end is Posi 3.70. It presently features a Harrison Aluminum radiator, the only non-correct part on the car. For judging purposes, one may need to replace it with a factory correct type. New Firestone tires on correct wheels with proper hubcaps. Interior is all new, all instruments and gauges being in working order, no reproach. Check out the power windows, a rare option for that year with only 698 out of 10939 produced. Soft top is new, also it comes with the optional hard top as well. It is very hard to describe in detail the amount of "blood", sweat and money put in this special Corvette. It would be impossible to recreate it for the money today, accordingly, it is a great investment with great NCRS judging potential. It is located in ILLINOIS and we can arrange delivery all over the country and all over the world. Corvette trades welcome, financing is available too.